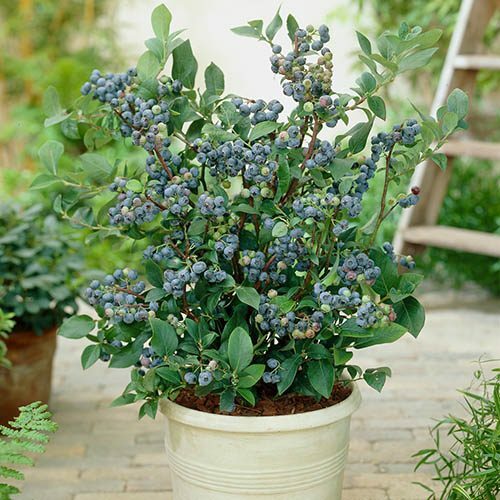 Grow your very own crop of incredibly tasty blueberries on your patio - yummy! Packed full of vitamins and minerals as well as antioxidants, they are not only really good for you but they taste great too! Blueberries provide true season-long interest and will produce wonderfully fragrant blossom in spring, followed by delicious fruits ready for picking from June onwards. Brilliant patio plants and will grow perfectly in pots do remember to use ericaceous (slightly acidic pH) compost though as all blueberries are lime intolerant. Grow your very own crop of incredibly tasty blueberries on your patio - yummy! This veritable superfood is believed to carry all manner of health benefits and is recommended by health experts and dieticians accordingly. Packed full of vitamins and minerals as well as antioxidants, they are not only really good for you but they taste great too! Blueberries provide true season-long interest and will produce wonderfully fragrant tubular blossom in spring, followed by delicious fruits that form and colour up ready for picking from June onwards.